Each year funding from TMT supports many students in participating in Akamai. Some students work directly on TMT projects, which provides training for jobs at existing telescopes in Hawaii, or directly with TMT, if the telescope gets built in Hawaii. Students get training, and make real contributions to TMT (see box below). ISEE is developing an international training program to support the TMT partnership in developing a future workforce. This program will provide training to TMT future leaders from all TMT partner locations. 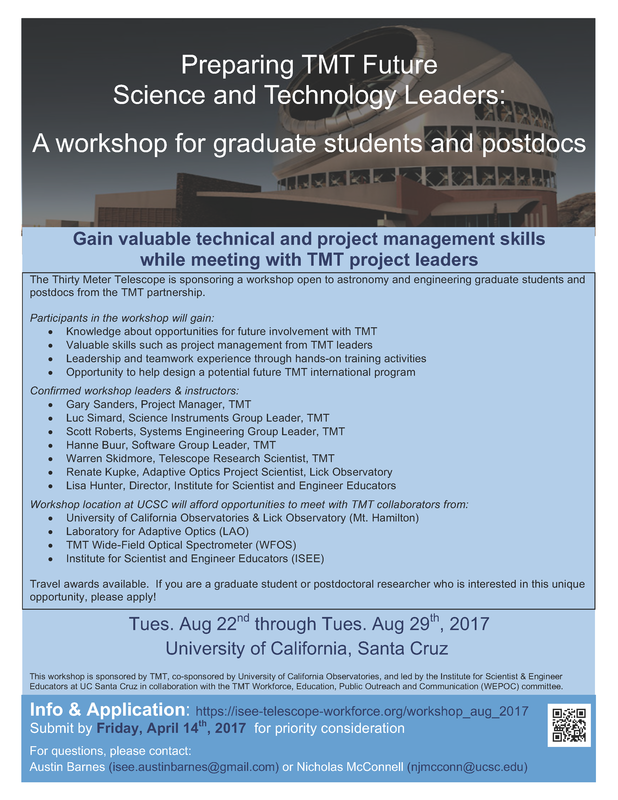 In August 2017 a workshop will be offered at University of California Santa Cruz, expanding and improving upon the 2016 piloted version. TMT is site sponsor for ISEE Mentor Workshop, that trains mentors in Hawaii to be effective mentors, and has created a mentor community dedicated to training that next generation.